Goddess Mahakali is first manifestation among the ten aspects of Dasamahavidyas. Mahakali is the most ferocious goddess among any other god. She is also considered to be the spouse of Lord Shiva. It is accepted that those who offers prayer and puja to her with dedication and whole hearted are secure from the enemies and black magic / evil effects. Goddess Mahakali homam is very effective and powerful homam which helps the devotee's indeed to get relief from any sorts of hindrances , afraid and sorrow in life. As per Vedic Scripture goddess Mahakali is believed to be the goddess of brave and power. Additionally those who perform this homam will get complete relief from malefic impacts of planets and karmic doshas. 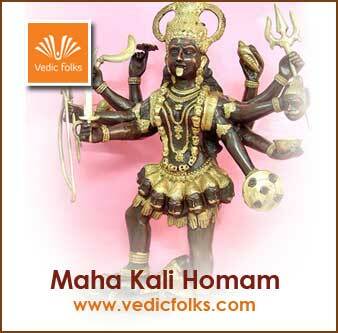 Mahakali homam is very favourable homam for eliminating any forms of obstacles in wider extend. 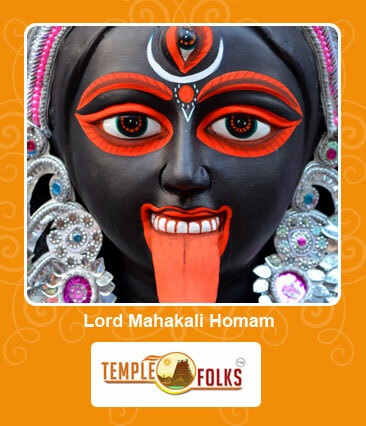 By performing this homam a person can diminish their fear and black magic issues to greater extend. In addition those who perform this homam can get relief from health related problems. Furthermore this homam is well suited for those who wants to enhance their self-confidence and courage. To get all the bounties and experience the enormous integrity of Mahakali Homam (fire customs or lab), you can get the assistance of our accomplished Vedic Purohits (intellectuals) at Vedicfolks.com on the web.